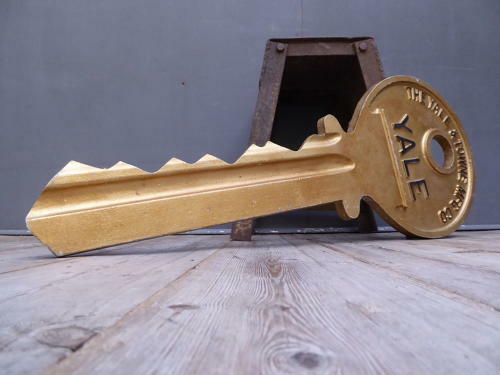 An oversized locksmiths trade sign in the form of a huge Yale key. An iconic, tactile & great looking piece of advertising of monumental proportions, cast in thick aluminium & a fantastic representation of a regular Yale key. As with a regular key, the writing on the grip is in relief & the blade differs on either side. A great display piece & a super bit of fun! Wear commensurate with age as pictured, unrestored, paint finish differs slightly on each side so either historically redone on one side or one side has just faded.